This book is designed to improve your Backgammon skills by using proverbs that I have made. 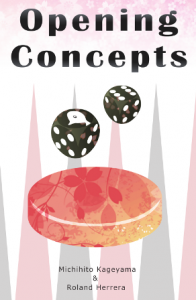 They represent the basic concepts in backgammon and play a major role in the book. You solve problems by applying suitable proverbs, then you will find the essence of the positions. In chapter 1 & 2, Beginner level, announcing 12 basic proverbs, which I really hope you will memorize.In chapter 3 & 4, Intermediate level, introducing you to 6 advanced proverbs. Together, these 18 proverbs cover most of the opening phase. In chapter 5, 6 and 7, Advanced level, I confront another 3 important concepts, tough even for advanced players. Appendix, Basics: If you are a newcomer, you really should start from this chapter. I explain the basic and important three actions in backgammon. In my opinion, the more you understand Backgammon, the more you will enjoy it. I really hope this book helps you feel better while playing Backgammon, an unbelievably well-crafted game.